It’s Friday, so Resolution #5 is in the form of a #GIVEAWAY! The vow? To keep an extremely open mind. I think in beauty, as in life, we get very comfortable with sets of assumptions, and I’m all about throwing them out the window in 2012. If you’re doing the same stuff you did last year, you’re not making progress. Right? 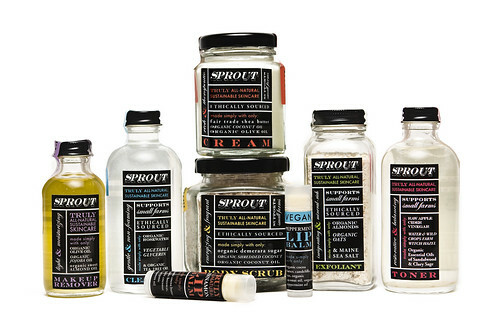 Sprout is an utterly simple and truly all-natural line of skincare that grew from Adina’s desire to cure herself. Her constant skin and digestion issues led her to study nutrition, but having addressed her diet, she was still frustrated by skin concerns … even with all-natural brands. She was given a ‘70’s book on how to mix your own natural skincare, ended up starting workshops on crafting beauty products, and then - with a set of perfected recipes - launched her own brand. 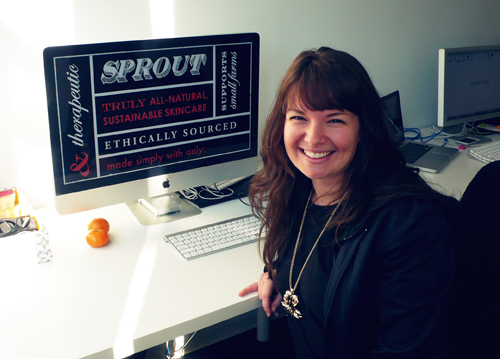 Sprout is handmade in Brooklyn and signed by hand. The packaging is mostly glass and so beautiful! All ingredients are organic, local and fair trade whenever possible (which is often). You know what’s in the stuff because the ingredients (around three per product) are listed on the front. It’s almost confusing because they’re so simple … you want to flip to the back to see the laundry list but there is none. I’ve heard so much about oil as the next wave in skincare - but I have really breakout-prone skin, so I had to take a leap of faith to get into Adina’s soap-free cleansing and oil-based moisturizing … but I took one look at her flawless skin and was sold. - Sprout Toner ($24): Smells so fresh, raw and amazing. Like kombucha for your face. Trust. - Sprout Cream ($32): Literally melts into your skin like butter, absorbing surprisingly quickly. Made from wildcrafted shea butter, coconut oil, and olive oil AND THAT’S IT. I know you’re thinking: I could never put that cream on my face … it’s too rich. Take it from a person who BARELY used even “non-comedogenic” moisturizer for fear of breaking out: this cream is a life-changer. I’m so glad I opened my mind, because it feels great to put something so pure and effective on your face every night. The line is all about “one product for every purpose for every person,” and Sprout has excellent customer service so feel free to write them for advice on what would be best for your skin. In the meantime, you can WIN the Cream, Toner and a Lip Balm of your choice ($61.00 value). Contest ends next Friday January 13th, 2012 at 11.59pm Eastern. If you subscribe or follow to enter, you must be subscribed or following at the time of the drawing. Multiple comments DO NOT increase your chances of winning but love ya.